today was the royal wedding of prince william and princess catherine. i stayed up all night to witness the fairy tale and what a beautiful show it was. 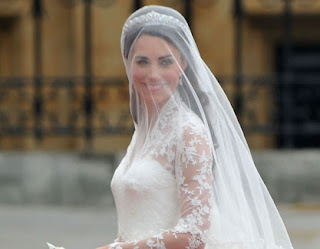 i realize we're not british or royal or even that important, but everything about watching this bride and this groom get married, was perfect. i kept thinking that she grew up in a normal family, much like our family, and now she is an actual princess. i was smitten with the whole affair and it was worth the hours of sleep i lost, even though my kids thought i was crazy. i'm actually watching it again with craig, who slept through the first showing. for the most part, the boys are not appreciating this, they're wandering around the house, watching baseball, and staying as far away from the girls as possible. since jake is not playing baseball (by choice) for the high school this year and he still loves to play baseball, he has put together a group of "high school bb drop-outs" and they have dubbed themselves the pirates. they play in a league of other high school age boys. tonight was their first game. it was an exciting win for the pirates with lots of fans, big hits, surprising stars, and a gimpy coach (evan, who had knee surgery today). oh, ya, knee surgery went well. evan had a band in his knee left from birth. in most people, this band dissolves over time, but his did not and when he hurt his knee slip and sliding last fall, it caused damage to the band which in turn caused pain. it was a best case scenario though because no cartilage had to be trimmed. he will be fully recovered in 12 weeks and can't run for a month, but he said that was okay because "running isn't my thing". isaac had a game in kearns. sam had a game in bountiful and then a game in ogden. it is so cold and yucky here, even though it's almost may. craig went to bountiful and ogden. i was sick so i watched american idol and fell asleep long before 11:00 when the ogden group got home. so my ship and craig's ship passed in the night. and evan is having surgery tomorrow, so an early morning for us. sometimes i feel like all we can do is hang on. isaac had another game tonight. in kearns. and it's freezing outside. so i endured the ride to kearns, picking craig up downtown along the way. i greeted isaac's game with anticipation, given the power hitting he displayed last night. tonight he got up four times. he walked once, and the other three times? his mighty swings produced three infield hits. one was a straight up bunt. i would call this the opposite of the long ball and while i digged the fact that he reached base safely four times, i did not dig hits that never left the infield. and we lost in the bottom of the last inning on a walk-off single. so boos all around. craig finally took my advice and had his foot x-rayed and it turns out he was right. it's not broken, but he has developed a hematoma, which is ug-ly. and i can tell it hurts, even though he is tough. jake went to the chiropractor because his back hurts. it looks like the back will be fixed after a few visits. he did learn that he will grow at least a few more inches and that made him happy. evan went to the allergist and learned that he can't breath. well, at least through his nose. steroids for him. at least this chick still does. i think home runs are the most exciting thing that happens in any sport. i love the home run trot around the bases. i love that the fielders have to watch the ball sail over their head. i love that the batter does it all by himself. i just love 'em. tonight isaac got up to bat in his rec game and in his pre-batting ritual, he pointed the bat towards the home run fence. it sure looked to me like he was "calling his shot", which is kind of embarrassing. but true to his form, after he talks the talk, isaac can usually walk the walk. first pitch he saw in the at-bat, he plunked over the fence and enjoyed a slow trot around the bases. and i digged it. i really enjoyed our easter sunday. it's always nice to hear testimonies of the saviour at church to help reinforce our own. we were lucky enough to hear president eyring's testimony of the atonement today in sacrament meeting. we are very lucky to see him at church almost every week. he has a strong, emotional testimony that i am personally grateful for. when we got home we were taught by the patriarch of our family about the last days of the saviour's life. we are so blessed to have a day and husband who also has such a strong testimony of Jesus Christ. i'm grateful that he would care enough about us to remind us of what things are important. after a few hours of napping and a little baseball, we went to grandma and grandpa parrys for a delicious chicken crepe dinner. it is fun to catch up with them and to see becky and ryan too. after a very bad game last saturday, the mighty blackhawks headed into today's tough doubleheader a little unsure. we were assigned to play one of the best teams in the state, the kaysville stars, who we have now beat three times in a row! we put together quite a game against the stars, winning 6-3 in the last inning. sam pitched the last inning and got the save--he was very excited. we really played well. unfortunately, as is often the case on those saturday double headers, we put so much into beating the stars, we had one bad inning in our next game and ended up losing by two--even though we were down by seven entering the last inning. even with the loss it was a very satisfying day of baseball. so you can so, in part, why i have a love-hate relationship with baseball. "a year ago right now, the last place i wanted to go to for school was BYU. now, i'm done with my freshman year and wishin i didn't have to come back! i wouldn't trade positions with anyone. thanks to all my amazing friends. from the core 4, to the munches, to the 3200 boys. thanks for changing my life, now it's my turn to change the lives of many others to come." this was evan's very grown up facebook status on the day i moved him home from byu. i'm really proud of him for making a hard choice, sticking with it and then making it work--even when he got cut from the baseball team and it was hard for awhile. i'm also grateful for the tender mercy that he received, knowing he had made the right choice. what a blessing for all of us. most of all today,, moving home day, i'm just glad he'll be home for a month. we're going to love having him around. i hate it when we have two awesome choices for the evening. tonight isaac had a comp game and also his first rec game. because of his comp experience and the hours of practice, rec is really fun because he can really dominate. unfortunately, isaac's comp team would have to forfeit if he didn't make it to the game so we had to skip rec. 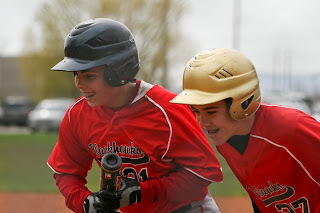 craig stayed behind and coached the mueller park angels to a 9-0 win without their two best players, while these two players helped their comp team to a very exciting victory. isaac threw three no-hit innings and hit in the winning run on a line drive to center field. caroline worked in the snack shack for the evening--earning money and socializing. i was positive the ankle bone was broken. being a man, craig followed the unwritten rule that he could not visit a physician unless death was imminent, and he went to bed. this was even after i begged him to go to the hospital. it turned out he was right. this time. this morning when he woke up his foot was about 40 percent less swollen and he could put some weight on it. all i can say is it's a good thing sam didn't try to hurt craig. caroline was selected as an outstanding student of the week at her school. she got a free meal coupon at cafe rio. this worked out really, really good for me because in addition to being proud of her for her oustanding-ness, i had no interest whatsoever in cooking dinner yesterday. when she came home with the good news, i thought it was perfect. i could tell craig we were getting cafe rio so we could use caroline's coupon without having to admit that there was really no back-up plan in the works. 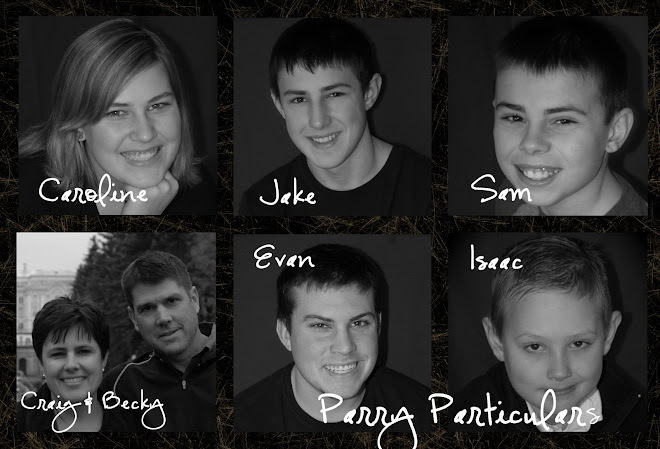 over the years, we have enjoyed being a part of mueller park baseball. we have had so many good times at the ballparks watching exciting games, good pitching and lots of long balls. evan once hit 15 home runs in a season on the bronco field. with four boys playing there at one time or another, there is obviously friendly competition between them. craig was president of the league for three years, which tied us closely with the day-to-day happenings there. my mom donated some money for new scoreboards a few years back and they now bear my dad's name. and we have worked there day after day. jake and evan have umpired many games, even thrown a few coaches out. we ran the snack shack for two years and worked there. this week is opening week of another fun season. sam is playing for the yankees and isaac is playing for the angels. caroline is working in the snack shack, jake and evan are umpiring, and sam and isaac are working as scorekeepers and announers. it's making me tired just to think of the time we will spend there over the next two months. so gotcha has pretty much been consuming jake and he takes pride in being good at it. but apparantly, all gotcha players at bountiul are now going to be punished for the actions of a few. there were some complaints about "kill" methods and also, someone was in a minor car accident because they were being stupid. so, gotcha was canceled, likely to never return again. this not only disappointed jake, but all the rest of my kids who were looking forward to playing when they got to high school. i hate it when the actions of a small number of people ruin things for everyone else. drives me crazy. i made ten recipes of banana/orange/pineapple slush for evan's farewell. took me the whole morning, but it was so satisfying to be done! tonight was going to be a busy night. four baseball games. but with constant rain all day long, we were suddenly completely free of anything to do. it was weird. everyone was home except evan. we had a short family home evening, then people scampered off to catch up on homework and to watch their favorite major league baseball teams play. caroline is running for sophomore office, so she started working on her hefty portfolio, which is due on wednesday morning. i like an evening off as much as the next guy, but i love baseball games. sundays nights are special around here. we loooove sunday night baseball. tonight we watched the yankees and the rangers, a very good game that wasn't settled until the 9th inning, with a great yankee win. we broke up the baseball game a bit with a game of settlers of catan, also fun. then we chased SNB with the amazing race. sure hope those cowboys win. church was a bust because isaac was still pretty sick. i woke up not feeling great either, so i stayed home--mostly to make sure isaac was breathing okay. craig was set apart as the sunday school president in our ward. it doesn't matter what calling he has, he always does an amazing job. i'm sure he'll be as good at this as he is at everything else he's done. i guess i would do half of today over. sam had his first two rocky mountain baseball games of the season today. in the morning game, the blackhawks played great, beating a good team by six runs. sam played great. during a two-hour break between games we lunched at hires and i made a pit stop at rc willey to look for a desk. the second game was tough. we played the rebels, where some of the kids who used to play for the blackhawks went to play. it was an ugly split and a lot of feelings got hurt. it's been two full years now, but sometimes those wounds open back up, especially for me. i have a hard time seeing former friends who made hurtful choices that hurt my feelings. most of all, i know that craig and sam felt really bad and i felt bad we had to play them. we played horribly so it didn't go well. it really wasn't any fun. so, i wouldn't do that part of the day over. isaac had to lay low today because every time he walked 20 feet, he started to cough. caroline had a tending gig. and jake had prom. he took a cute senior girl and i'm so glad she got to go to her senior prom. it sounds like they had fun. caroline, isaac, craig and i went to a local pizza restaurant for a quick dinner. after ordering we realized that the restaurant didn't separate their pizza toppings. i even went into the kitchen to take a look. two of the toppings they offered included pine nuts and pecans. this obviously wasn't going to work for isaac since the kitchen workers put their hands in the pine nuts and then straight into the cheese without any sort of sterilization. boo to this method! isaac assured us that we could eat and it wouldn't bother him. he got an italian soda and the rest of us ate, then afterwards we got him a dozen hot rolls from texas roadhouse, so he was okay. jake is very much looking forward to his student body officer duties next year. he will be vice president over student recognition. i can't think of someone more qualified to make people feel good about themselves. jake is going to do awesome. isaac stayed home sick today from school. when a healthy person gets a cold, it's usually not a big deal, but when isaac gets a cold, it often means he has to go on steroids just to breath. he coughs a lot with the smallest exertion. it's kind of a drag. resting today helped a lot and predictably when it was time for his baseball game at 7:30, he felt like he could play. he caught and pitched, which are both taxing and it was very cold, so when the game ended he coughed for several hours and we thought of taking him to the emergency room. luckily, a steam shower and a sleeing pill helped and he was able to get to sleep. "you stole my soul and that's a pain i can do without". words made famous by rod stewart in his classic 'maggie mae'. 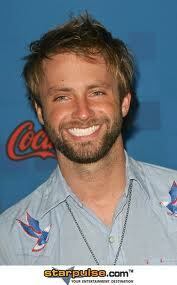 of course paul mcdonald didn't really steal my soul, but he did get my vote on american idol, lots of my votes. his rendition of the famous 'maggie mae' slayed me. it was one of the coolest songs i've seen performed on american idol. the big bummer? he got voted off last night, which i do. not. understand. boo and hiss. last night's gotcha performance was wild and crazy and included fence jumping, running, screaming, pushing. jake's friend, mike brown, even took a bullet (spray bottle to the face) for jake. it ended with jake safely tucked into our house. stay tuned for the next chapter. evan called to say hi tonight and while i was talking to him it occurred to me that for the next two years i'm going to wish a million times that he could call just to say hi. i guess it's a luxury i've been taking for granted. gotcha started today at the high school. that means all hands on deck. if the doorbell rings, we have to communicate through glass, because no one can be trusted. gotcha is a game played in the spring where you are assigned to "kill" another student at the high school. it is death by squirt bottle. last man standing is the winner. jake successfully pulled off the first kill of gotcha 2011. i lured his unsuspecting friend into the house and boom, he was dead, and really, really mad at me. i explained that all is fair in love and war. the problem with this game is that jake plays and the rest of us get really invested because we have been enlisted to help. last year jake finished in the top nine. he got sloppy. thinking back on today, i was pretty sure that absolutely nothing happened. nuttin'. craig is still in indianapolis. kids are back working hard at school after spring break. dogs are so happy to be home. that's it. the only bright spot was my morning "run". i have decided to be a runner. i hope i make it though. my goal is to be able to run five miles by the end of the summer. i think i can build up a little each month. the more immediate goal is to be able to run two miles by the end of may. i took the dogs, which is funny because jeter loves to go for walks and loves to explore, so he was pulling me on his leash. romeo, not so much--he doesn't want any part of it. so, while being pulled by jeter, i have to pull romeo. it's quite a little dance. i'll be sure to post updates of my progress. this is where craig is tonight. it's an unfamiliar skyline, so i bet most of you can't guess. if i saw this photo, i would not be able to guess. in fact, i don't think i've ever been here and i've been a lot of places. craig is in indianapolis until wednesday. post-trip-hangover is not good, especially when you missed a whole night of sleep driving home. i'm not young enough to go without sleep anymore. everyone is pretty tired today. and the worst thing about coming home from a trip is the dirty wash. ugh. sometimes craig asks me if i'm going to keep my suitcase packed and on the floor until we go somewhere else--that's how long it takes me to unpack. the good news today is that my suitcase is unpacked and in the storage room. but the clothes are all dirty. dinner time was weird today. craig gone. evan at byu. jake and caroline at the hospital volunteering (they get dinner in the cafeteria when the volunteer). sam had two baseball games in ogden. and i'm for sure not cooking something if it's just isaac and me. jake just went to bed at 9:00 with a bad headache. i hate it when jake has a headache. i'll probably worry all night now about a brain tumor. we ditched out on last night's tied angels game in the 12th inning (it finally ended in the 14th) and headed for the barn. we left anaheim around 11:15 wanting to get a few hours uner our belt and thinking we might stop somewhere along the way for the night. but craig, our hero, was an iron man and the miles whizzed by with him at the wheel. the kids slept and i tried to stay awake and talk with craig (i made it to nephi before crashing for 45 minutes). we were so glad to have sunday at home to recover and get situated before schoool starts up again tomorrow. today we drove from anaheim to santa barbara, where craig's mom grew up. we spent some time at the beautiful mission. we were able to find the headstones of craig's grandparents and his aunt, who are buried in the beautiful santa barbara cemetary, overlooking the pacific ocean. this is the house that linda grew up in. the owner was nice enough to let us come in and also look around the back yard when she found out who we were. we ended our fun trip at a very cold baseball game. it was really cold and we all wore our free angels beanies. the game was much more enjoyable from our vantage point behind home plate. caroline and i gave up in the 8th inning because we were freezing. we headed for the car to warm up and read. we thought the boys would be along soon, but the game went into extra innings. since we were driving home after the game ended, the boys took mercy on us and left after the 13th inning and the angels won the game in the 14th. sam was a good sport to leave. thanks, craig, for an awesome spring break vacation. we returned to our roots today, attending the angels home opener of their 50th anniversary season. sam was in seventh heaven. after spending the morning in santa monica visiting with our friends the blakes, who recently moved to the los angeles area, we fought l.a. traffic and arrived at the big "a" in time for batting practice. unfortunately, we had outfield seats and sat around some very rude, distracting people, and the angels lost, but it's still a joy to be at a game together as a family. i still love to go to disneyland. in fact, it brings to mind such strong memories of my youth and my dad, that i would go to disneyland all by myself. today, i let my kids and my husband tag along. it was crowded for sure, but still had the magic for me. we enjoyed a fun day starting with space mountain and ending with a train ride all the way around the park. i will say that my kids had much more stamina as pre-teens than they did today as teenagers, as they all claimed utter fatigue at around 7:00 p.m. thanks for going with me because i loved it! we got to see another baseball game today in san diego. before the afternoon game, we went to old town san diego, where we looked in some fun shops, bought a few kitchy items and then had lunch at the coyote cafe, allegedly the best mexican food in old town. i enjoyed the fried ice cream for dessert! then we headed for the game. after the game we headed for anaheim. we were lucky enough to listen in on the phone when ramsey, evan's roommate, got his mission call to olangapo, phillipines. we also passed the san diego temple on our way from san diego to anaheim. it's a beautiful, castle-looking building right on the side of the I-5. today was the home opener for the san diego padres. we were lucky enough to stay in a hotel right across the street from the stadium. in fact, we could see much of the field from our hotel room. we had these awesome home run porch seats. pregame was exciting. during home opener player introductions, lots of celebration occurs and every player and member of the coaching staff for both teams is introduced. we even got a fly over after the national anthem. this huge flag was marched out by members of the navy. it covered the whole outfield. isaac and craig weren't sure they would be at this first game because they flew down, so their seats were a few rows behind us. it was a very exciting game even though we didn't catch a home run ball. only one ball was hit deep to left field and it didn't clear the fence. after the game we had a yummy italian dinner in the gas light district of downtown san diego. i love a good road trip. i was so happy to get outta here. it's spring break and it's not really that warm in utah and it's just good to go on vacation. we are missing evan, but get used to it i guess. jake, caroline, sam and i headed out this morning, destination: vegas. we had a great drive, made good time and the kids were productive in the car. we checked in at the cosmopolitan and had a great view of the dancing fountains at the bellagio. the four of us walked what seemed like a mile to the forum shops at ceasar's palace and had such a good dinner at the cheesecake factory. after a little shopping, we hit the hay for a big day tomorrow. we're meeting craig and isaac, who are flying, in san diego for the padres home opener. can't wait! a favorite tradition is conference breakfast! each conference sunday, craig's parents host a yummy breakfast for friends and family of eggs benedict and scones. my kids countdown the days to the scones and i love the eggs benedict. ryan usually goes and makes the poached eggs just right for me (runny), but he was sick today so i had to settle for hard eggs. other than that, it was fun to see everyone, fun to eat, and conference was again wonderful. today was a good conference day. i loved president eyring's talk. i loved having evan home with the five zoobies he brought with him. i loved getting a pedicure with caroline. i loved watching the red sox get hammered by the rangers. i loved the warm weather until it started to rain. i love knowing we are going to california next week and it will be warm. i loved dinner with caroline and isaac at salt city burger while the boys were at priesthood. after priesthood, the boy group ate at texas roadhouse. today was a horribly long day. i went to the temple in the morning, that killed two hours. i went for a walk with the dogs. that killed maybe 35 minutes. i cleaned and did a little wash. 45 minutes. did some computer work. 30 minutes. i got sleepy so i laid down and thought i could kill 30 minutes that way, but i was way too hyped up to fall asleep. i turned on the end of the phillies-astros game and that was the ticket. it was a very exciting, phillies-come-back-in-the-9th-inning, kind of game. so that killed the rest of the time up until about 1:50 when i started to just stare at my phone willing jake to call me. i knew that they were announcing the new student body officers for next year at 1:50, but jake wasn't calling. i texted him. i texted him again. then i called him. finally i gave up and called the school, asking who won the sbo election...the secretary who answered read jake's name third. whew. so excited for him! congratulations jake.